The latest Chesterfield magistrates’ court results as published in the June 14 edition of the Derbyshire Times are listed below. Lee John Kellett, 43, of Chapel Road, Grassmoor, Chesterfield. Found guilty of possessing a lock knife in public without lawful authority or reasonable excuse. Must pay a £115 victim surcharge and £310 costs. Committed to prison for six months suspended for 12 months with a Drug Rehabilitation Requirement, a Thinking Skills Programme and Rehabilitation Activity Requirement. Steven Michael Johnson, 52, of Pingle Grange, Brimington, Chesterfield. Pleaded guilty to assault by beating. Fined £244 and must pay £300 compensation, an £85 victim surcharge and £85 costs. Pleaded guilty to sending a voicemail that was grossly offensive or of an indecent, obscene or menacing character. Community order to last until March 3, 2019, with a Rehabilitation Activity Requirement. Restraining order to last until June 3, 2019. Robert Edmund Reeve, 44, of Fletcher Street, Ripley. Pleaded guilty to damaging a vehicle. Fined £162 and must pay £70 compensation, an £85 victim surcharge and £620 costs. Pleaded guilty to assault. Pleaded guilty to using threatening behaviour. Community order to last until June 3, 2019, with Alcohol Treatment Requirement and a Rehabilitation Activity Requirement. Restraining order to last until June 3, 2019. Liam Booker, 18, of Byron Road, Birdholme, Chesterfield. 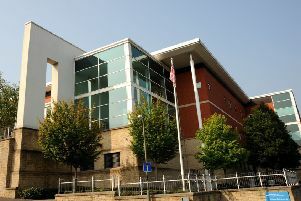 Pleaded guilty to damaging a door window belonging to Mirage, at Market Hall, Chesterfield. Must pay £300 compensation, an £85 victim surcharge and £85 costs. Pleaded guilty to driving while disqualified from driving. Must pay £85 costs. Community order to last until June 4, 2019, with 80 hours of unpaid work. Disqualified from driving for 12 months. Pleaded guilty to using a motorbike without insurance. No separate penalty. James Douglas Neeve, 23, of Neale Street, Clowne. Indicated a guilty plea to entering a property as a trespasser, namely Beard, on North Road, Clowne, and stealing three hair clippers, two scissors, eight hot towels, an assortment of hair products and a bag of towels. Must pay £1,070 compensation. Pleaded guilty to damaging a CCTV camera valued at £150 belonging to Mobile Repairs Ltd. Must pay £150 compensation. Community order to last until June 5, 2019, with a 12 week curfew with electronic monitoring and with a Thinking Skills Programme and a Rehabilitation Activity Requirement. Ann Howe, 29, of Scarsdale Street, Carr Vale, Bolsover. Admitted failing to comply with a community requirement of a suspended sentence order by failing to attend with a responsible officer. No adjudication. Must pay £60 costs. Dealt with for the original offences which were subject to the suspended sentence order including stealing electrical oral care items valued at £105 belonging to Wilko Retail Ltd, stealing health and beauty items valued at £275.98 belonging to Boots, stealing health and beauty items valued at £24.40 belonging to Wilko, stealing scratch cards valued at £25 belonging to Tesco Express and stealing goods valued at £29.67 belonging to Tesco Express and failing to surrender to custody having been released on bail. Committed to prison for six weeks suspended for six months. James Martin Youds, 38, of no fixed abode. Indicated a guilty plea to stealing two bottles of Chanel perfume and one bottle of Gucci perfume valued at £273 belonging to Boots. Must pay £273 compensation. Committed to prison for eight weeks. Admitted committing an offence while subject to a conditional discharge for 12 months imposed for an offence of theft from a shop. No action taken on the breach. Martin Stephen Conneely, 39, of North View Street, Bolsover. Pleaded guilty to three counts of stealing alcohol belonging to One Stop. Must pay £18.24 compensation, a £20 victim surcharge and £85 costs. Discharged conditionally for 12 months. Darren Snowdon, 33, of Church Street South, Birdholme, Chesterfield. Pleaded guilty to stealing washing-up tablets belonging to the Co-op. Must pay £41 compensation. Pleaded guilty to stealing two jars of coffee belonging to Birdholme Service Station. Indicated a guilty plea to stealing coffee and washing detergent belonging to One Stop. Must pay £85.82 compensation. Indicated a guilty plea to stealing washing detergent belonging to Singh’s stores. Must pay £21 compensation and a £115 victim surcharge. Indicated a guilty plea to stealing three boxes of Milk Tray belonging to Co-op stores. Indicated a guilty plea to stealing more Milk Tray belonging to the Co-op. Indicated a guilty plea to stealing more Milk Tray belonging to Co-op stores. Indicated a guilty plea to a further count of stealing two boxes of Milk Tray belonging to Co-op stores. Indicated a guilty plea to stealing coffee belonging to Birdholme Service Station. Indicated a guilty plea to stealing shower gel and magazines belonging to Birdholme Service Station. Indicated a guilty plea to stealing deodorant belonging to Birdholme Service Station. Indicated a guilty plea to stealing coffee, sweets and deodorant belonging to Birdholme Service Station. Indicated a guilty plea to stealing coffee belonging to One Stop. Indicated a guilty plea to two counts of stealing washing detergent belonging to Singh’s stores. Indicated a guilty plea to stealing coffee belonging to One Stop. Committed to prison for 15 weeks suspended for 18 months with a Drug Rehabilitation Requirement and a Rehabilitation Activity Requirement. Admitted committing an offence while subject to a 12 month conditional discharge imposed for possessing a class B drug. No action taken on the breach. Stephen John Alsop, 58, of Pear Tree Drive, Shirebrook. Indicated a guilty plea to stealing five model sets belonging to Hobbycraft, at Ravenside Retail Park, Chesterfield. Indicated a guilty plea to stealing a Philips shaver belonging to Boots. Must pay £300 compensation. Community order to last until June 6, 2019, with a 12 month exclusion requirement not to enter Chesterfield town centre. Admitted committing an offence during a suspended sentence order for an offence of driving while disqualified. Fined £50. Neil Paul Surr, 34, of Alice Head Road, Ashover. Pleaded guilty to speeding. Fined £110 and must pay a £30 victim surcharge and £85 costs. Driving record endorsed with three points. Maria Callaghan-Barber, 23, of New Close, Eyam. Pleaded guilty to exceeding the alcohol drink-drive limit. Must pay £100 compensation, an £85 victim surcharge and £85 costs. Community order to last until August 12, 2019, with a ten week curfew with electronic monitoring. Disqualified from driving for 24 months. Thomas Andrew Kirkham, 28, of Nelson Street, Newbold, Chesterfield. Pleaded guilty to exceeding the alcohol drink-drive limit. Fined £1,000 and must pay a £100 victim surcharge and £85 costs. Disqualified from driving for 24 months. John Shally, 48, of Harris Avenue, Ripley. Pleaded guilty to exceeding the alcohol drink-drive limit. Fined £506 and must pay a £50 victim surcharge and £85 costs. Disqualified from driving for 12 months. Stephen Lawton, 31, of Langwith Road, Langwith Junction. Pleaded guilty to assault by beating. Committed to prison for 26 weeks. Restraining order to last until further order. Must pay a £115 victim surcharge. Carl Martin Broadbent, 52, of Danby Avenue, Old Whittington, Chesterfield. Indicated a guilty plea to possessing 3.10grammes of 5F-MDMB-PINACA, a class B drug. Fined £80 and must pay a £30 victim surcharge.